Why would anyone take a perfectly good 1969 Triumph T100 S and make it into a dirt bike? Like any customising job building the ISDT replica turned out to be way more work than I had imagined, however the result has also been ahead of my expectations. My motivation for building the Triumph was simple enough. I was brought up on a diet of English motorcycle magazines because as a lad growing up in the 1960s I was fed copies third hand from a friend of my father. 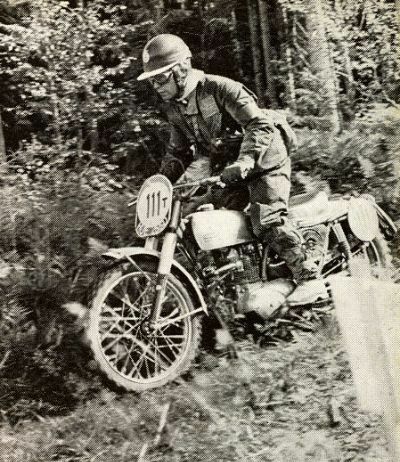 The stuff that really interested me was the scrambles and trials, and trials in those days were not only the feet up stuff, but also included the multi day endurance events like the ISDT (ISDE) that we now call enduros. My heroes therefore were the like of Jeff Smith, Arthur Browing, Sammy Miller and in the long distance stuff, Ken Heanes, John Giles and Roy Peplow. 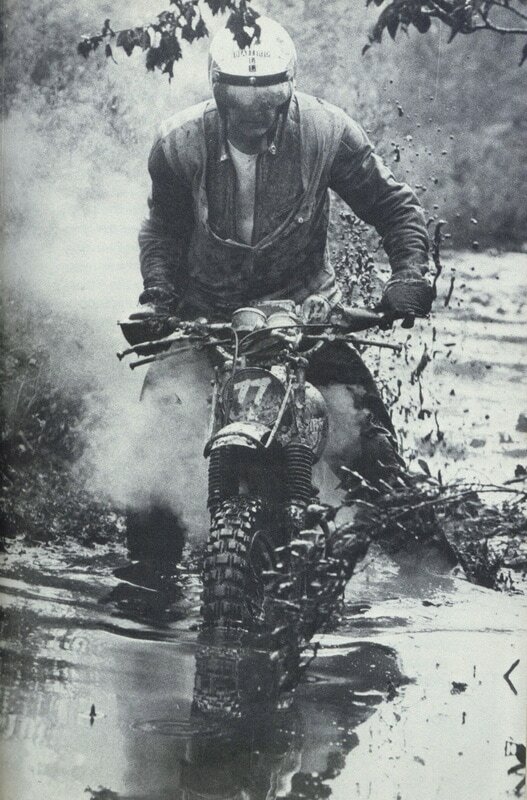 Then of course came film actor Steve Mc Queen, a Hollywood star who to add icing to any boy's dream was no show pony, this man really raced dirt bikes and was actually quite good at it. My heros rode Triumphs, real men's bikes with a proper exhaust note and with amazing success, in events like the Welsh Two and Three Day and International Six Days Trials (enduros). 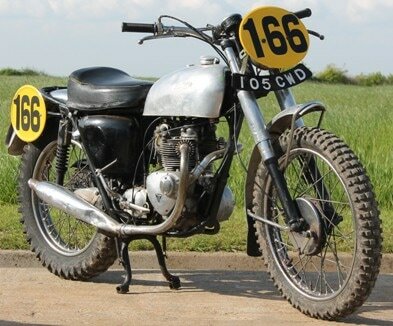 Their machines were most often unit 500cc Triumph twins, descendants of the most famous off road winning Triumphs, the rigid-framed pre-unit 500cc TR5s that won the World Trophy in the I.S.D.T several times in the late 40s and early 50s in the hands of Bert Gaymer, Jim Alves et al. That the now re-born Hinckley Triumph can now name a modern road bike the ‘Trophy’ beggars my belief, but that’s another story.Into the 1960s the swingarm Triumphs were still at the top of the game, though by the early 70s lighter Cheney and Rickman frames were resorted to. 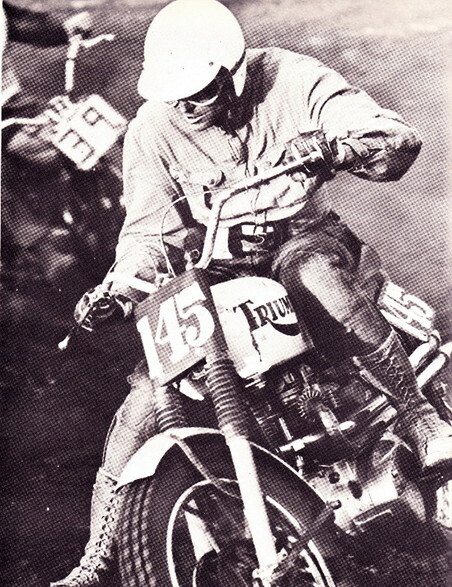 Triumph attempted to revive the Trophy's enduro fortunes again in 1973 when the factory entered a team in ISDT, that year held in Dalton on the East Coast of the USA. 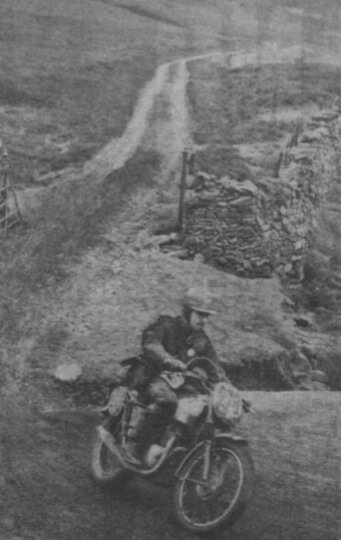 These were the new 500cc Adventurer models, essentially Triumph Trophy engines fitted into BSA off road frames. Though the team rode with great success, the effort was in vain, for Triumph, along with the rest of the British Motorcycle industry were in severe decline, blighted by head in the sand management and the subsequent stand-offs with militant Marxist unions. In the end they all lost their jobs. But that too is another story, so with some time and a little spare cash in my piggy bank I thought it would be fun to build up a sort-of late 60s Triumph ISDT replica. A replica it would have to be because there was virtually no chance that I could ever find a genuine ISDT Triumph. Those bikes that survive are now highly prized and it must be remembered that Triumph were far better at promoting their factory riders success than actually producing replicas that the public could buy. 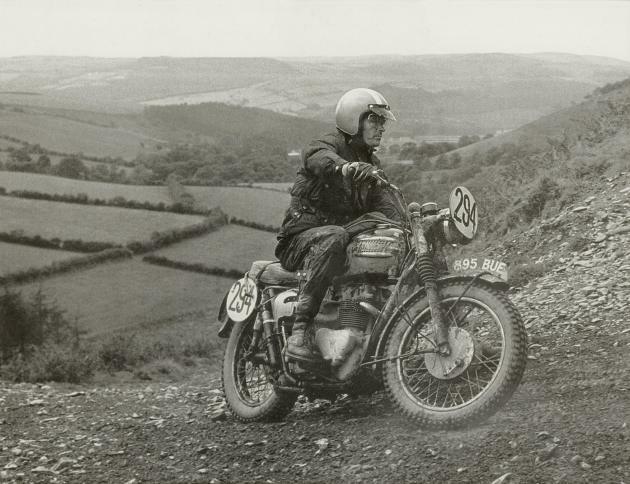 Though Triumph did produce a full replica production TR5 Trophy in the late 40s and early 50s successive Trophy models became less off road oriented, so that by the late 60s differences between the Trophy and the road models were minimal. Through this time it was only in the Competition Department that real off road Triumphs were made albeit in very small numbers. My concept then, would be to attempt to build a bike strongly reminiscent at least, of the works machines. 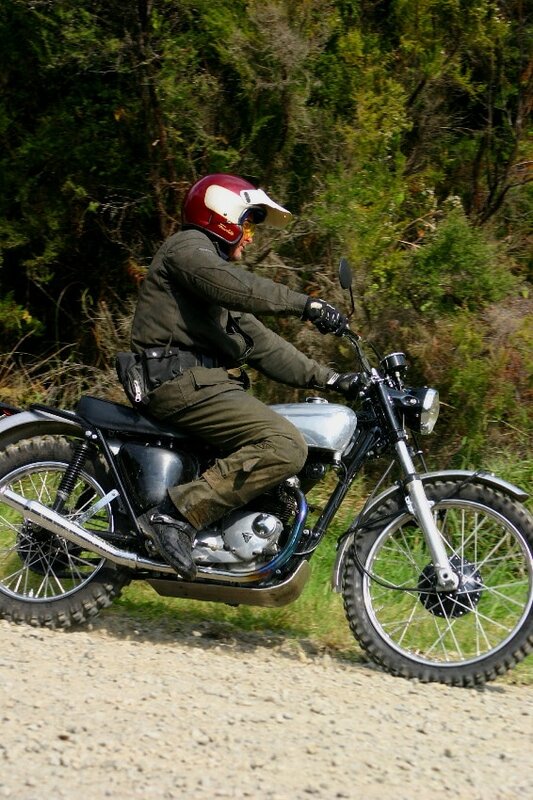 This would be no show stickler, rather a practical machine (as much as an old Triumph can be) to ride on and off road, to such an extent that it might be a good enough adventure bike to tackle an event or two each year without crippling this aging rider. Like all good projects this one has had a mighty long gestation, over 20 years in this case, but it is finally complete. British Spares from Motueka gave the impetus needed with the sourcing of a wide-ratio gearbox cluster and many other detail parts to make the conversion work. Over the next few months I will cover the modifications I have made to the engine, frame and cycle parts and show how the ISDT Triumph is coming together, and in time what it is like to ride. The five times ISDT winner, my bike is modelled from. Building a truly off road capable Triumph was more difficult than I expected but the resulting has exceeded my expectations. 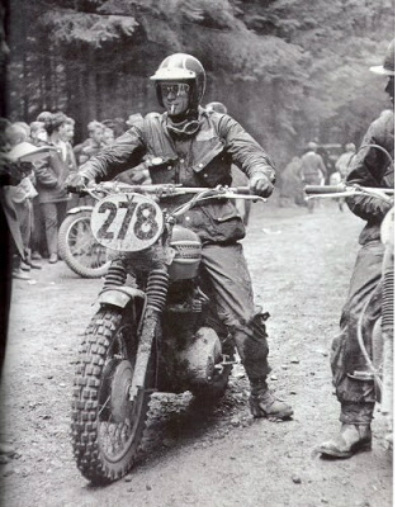 Bill Baird, seven times USA Enduro Champion rode a T100 with Ceriani forks and wide ratio transmission. 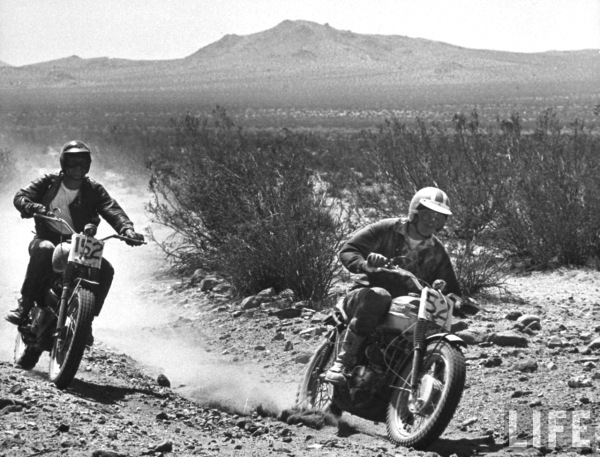 Triumph racers in a Californian desert race in the 1960s. Triumphs publicity stock was greatly aided by rider number 52 - that's movie star Steve Mc Queen again, who certainly means business in this shot. 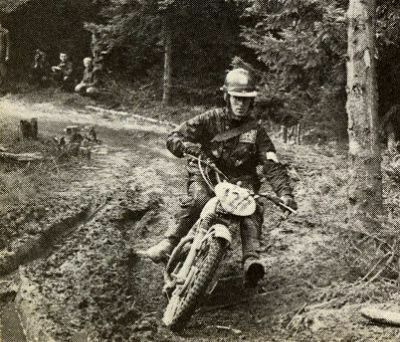 British Team member John Giles in the ISDT in Germany. Ken Heanes another great works Triumph rider. Works rider Roy Peplow topped the ISDT in Wales.